Sheridan House has been nationally recognized again by Charity Navigator for effectively managing our finances. 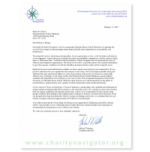 Charity Navigator is the nation’s largest independent non-profit evaluator. We received their highest ranking of 4-stars, demonstrating to our donors that we are fiscally responsible and trust-worthy. Only 25% of all charities are able to qualify for this status and we honored to one of them! We understand the importance for donors to have knowledge and confidence that their financial support will be utilized wisely prior to supporting a particular organization. Based on our most recent financial reports, Sheridan House has proven our ability to efficiently manage and grow our finances, as well as execute our mission in a fiscally responsible way. Donors who demand accountability, transparency, and quantifiable results can rest assured that Sheridan House is fiscally responsible in carrying out the mission of honoring Christ by serving the needs of children and families. Thank you for partnering with us. It is because of your continued support that we are able to serve so many children and families in need.